Seismic source zones for Thailand was first introduced by Nutalaya et al. (1985), based upon both seismological and geological evidences. Subsequently, Shrestha (1990) identified 9 active faults in the country on the basis of only seismological data analysis. 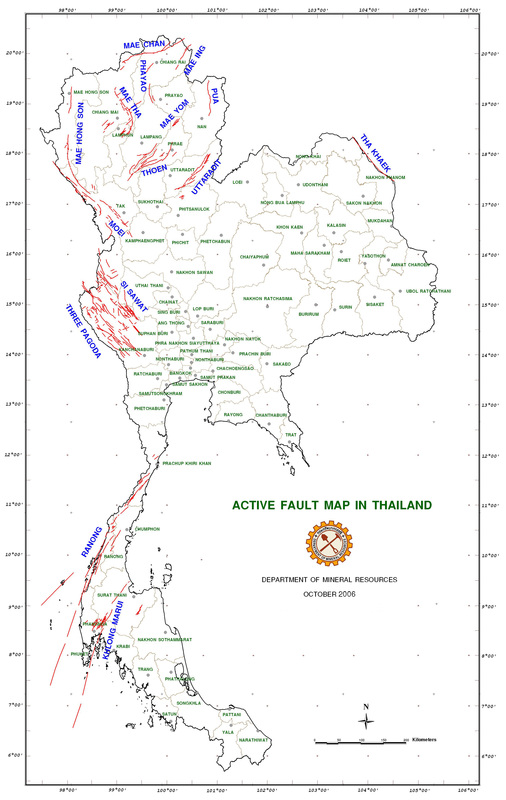 Recently Department of Mineral Resources put an enormous effort to produce the active fault map of Thailand (Fig. 1) with the co-operative research studies of Chulalongkorn University (Thailand) and Akita University (Japan) on the bases of all the relevant geotectonic, digitally - enhanced satellite-borne image, geochronological, historical and seismological data along with the earlier published works (e.g., Hinthong, 1995; Nutalaya et al., 1985). Apart from the above - mentioned information applied, the other significant data are from the results of morphotectonic trench log and geophysical investigations. This commences with remote sensing interpretation to determine significant lineaments, follows with Quaternary field mapping of landforms, and then identifying morphotectonic features and styles � including primary, as fault scarp degradation and secondary, such as offset and beheaded streams, sag ponds, shutter and pressure ridges. Then ground geophysic (resistivity and GPR) surveys are carried out to confirm the existence of the interpreted faults. Detailed geodetic survey has been performed in detail to locate the appropriate site for exploratory trenching. Detailed stratigraphic logging has been done prior to sampling for Quaternary dating have been made. Based upon these consecutive sequences of work, we can delineate the Fault Zone (FZ), which is herein defined as linear or elongate zone of seismicity commonly classified by neotectonic movement and coincident with major tectonic structures. As displayed in Fig. 1., Thailand consists of 15 active FZ. Followings are a summary of the faults that have been studied. 6) The 45 km-long, NNW-trending Phayao FZ exhibits a sharp scarp clearly observed from the Landsat image suggesting Quaternary movement with eastward down-thrown side to the Payao Basin, possibly related to the so-called Kwan Phayao Lake. This lake is interpreted representing the large sag pond � an internal fault wedge basin which forms branches in the bifurcating dextral fault as a result of slip movement. The 1994 Pan earthquake with the magnitude about Mb 6.0 at the northern extension of the fault provides the good evidence on a fault � generating earthquake. Based on focal mechanism, Bott et al. (1997) considered that the similarly oriented fault is located possibly within the Payao basin. 12) The NW-trending Three Pagoda FZ joins the Sagiang FZ of Myanmar. Its length in Thai portion is about 200 km. It occupies the Quae Noi and Mae Klong River channel. The moderate earthquake of Mb 5.8 was reported close to this FZ during 11 January 1960. Two other tremors occurred on 22 January and 11 July 1985 with Mb 4.5 and 3.9, respectively. However, these quakes are regarded to have occurred as a result of RIS (Hetrakul et al., 1991). Later minor quakes, as evidenced by the swarm-type spatial and temporal distributions, show mostly the dextral motion along the NE-trending conjugate fault set. TL-, ESR, and C-14 dating data of samples collected from fault � related colluviums nearby this FZ, yield the movement age of 2.0 ka. 14) The Ranong FZ is one of the northeast- to north-northeast-trending faults that traverse the Peninsular Thailand. The Ranong FZ extends from near Prachup Khirikhan on The Gulf of Thailand coast southwest towards Ranong on the Andaman Sea. The total fault length is approxmately 220 km. The FZ, which follows the channel of the Kraburi River, has its subsidiary faults cutting Late Cretaceous granites (Charusiri, 1989) and Cenozoic sediments. However, a few hot springs was found near and along the southern end of the fault, implying that the fault significantly provides conduits for the geothermal field. The hotsprings in Myanmar and Vietnam are always spatially associated with several active faults. Landsat information indicates that the Ranong Bay is largely controlled by the fault movement. In addition, data from seismic stratigraphy in Andaman Sea indicate a well � defined Ranong FZ cross-cutting Cenozoic sediments almost to the top horizons. Sinistral movement along this FZ is reported by Garson et al. (1975) as having a total horizontal slip of 20 km. Shrestha (1990) noted that an earthquake of Mb 5.6 happened along this fault during 30 September 1978. Our recent TL dating data confirm the movement along the Ranong FZ occurring in Late Quaternary time. Bhongaraya, S., Thiramongkol, N., 1998. Geomorphology of the Ping and Wang River Basin, Amphoe Sam Ngao and Ban Tak area, Tak. In Proceedings of the Ninth regional Congress on Geology, Mineral and Energy Resourses of Southeast Asia (GEOSEA�98), Kualua Lumpur, Malaysia, p 13 (Abstract with program). Charusiri, P., 1989. Lithophile Metallogenic Epochs of Thailand: A Geological and Geochronological Investigation. An unpublished Ph.D. thesis, Queen�s University, Kingston, Ontario, 819 p.
Nutalaya, P., Sodsri, S., Arnold, E.P., 1985. Series on Seismology Vol. II � Thailand, Southeast Asia Association of Seismology and Earthquake Engineering, Bangkok, 403 p.